Go Troppo Arts Festival Over for another Year. 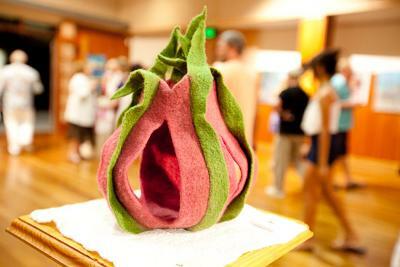 Go Troppo Arts Festival, Port Douglas, brought some innovations to festival participants this year. One of the most important of those, to the community as a whole, was the Tropical Footprints exhibition at the Community Hall. 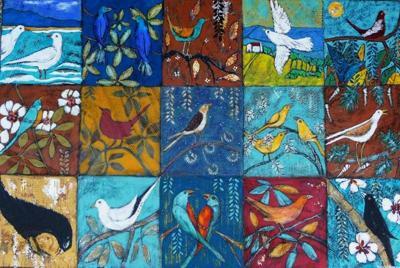 Organised by Elizabeth Perriam and sponsored by the Port Douglas and Mossman Gazette newspaper, an open invitation was issued to all artists of the Cairns (especially Douglas) region to enter work in the exhibition, from which a dozen or so would be selected for auction at the end. The standard of work was very high indeed and the resultant display, courtesy of Cairns Regional Gallery's curatorial staff, was stunning. 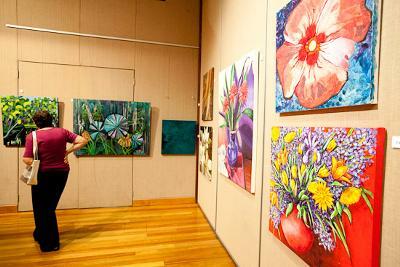 Volunteers ably organised and manned the exhibition, which comprised over 80 works. Go Troppo Arts Festival encourages volunteers to assist with many of the tasks associated with running the festival and they always come up 'tops'. There is also the opportunity to learn about various aspects of arts management and display, so the experience can enhance their skills as well as benefit the festival - hence the community. On the night of the auction, a hundred or more locals and visitors, dressed in their cocktail party best, enjoyed the artwork and the excitement of the auction as well as delicious refreshments provided (at no cost) by Zinc and Nautilus Restaurants and the Court House Hotel. The foyer showed the stunning large works of the late Strom Gould, who was a leading artist in Port Douglas during the 'seventies and 'eighties, so the event was a 'trip down memory lane' for some long-time residents. Elizabeth, the Gazette newspaper, Cairns Regional Gallery, artists, the auctioneer, Daniel Keech and teams of volunteers are to be congratulated on a fabulous exhibition, which gave a chance to every artist, whether they were established or emerging to show their work in a supportive and professional environment. Let's hope that this open event is here to stay. Ted, it is so encouraging that you take the time to comment on various submissions. Yes, running a festival is a lot of work but when it turns out well and just keeps on improving that is very satisfying. A long journey I know, but perhaps you will come to our next one? Elizabeth, I know how frustrating you found that experience of dealing with inefficiencies of non-existent lights and a public address system that didn't work when you wanted it to. Take heart that you and your helpers did a superb job and made it all look so easy - the result of excellent planning and systems. That you were embarrassed and disappointed that local government staff were so inefficient and disinterested is understandable. The situation reflected on the Go Troppo Arts Festival as a whole, a great shame when one considers how hard we have all worked to improve the quality and professionalism of the event. My advice for anybody hiring the Community Hall is to undertake an inspection with a council staff member 48 hours prior to your event. We undertook an inspection, but it was prior to the Mossman High School Musical, during which there were major electrical problems. Nobody within the Council advised us that an electrical box had been removed for repair and as a result we had an opening minus a great majority of the lighting. Despite requests prior to opening for 10 globes to be replaced - this was never carried out. the week of the exhibition we had major failures with a total of 38 lights being out. On the final evening of the cocktail party and auction we had NO lights in the entrance foyer in addition to missing globes in the hall. A level of interest or acceptance of responsibility on the part of the Council was not forthcoming. I would not use the Community Hall for any future events I was asked to manage. Plenty of other venues available who would be happy to participate in such an event. I know many worked their butts off in order to make this a success, and the response confirms the appeal to the public by their attendance and appreciation and response to all the effort. Now one can sit back and breath a sigh, "we did it!" Click here to return to Announcements. This paper engages with the recent computer-mediated video installations of Australian media artist, Tina Gonsalves. Gonsalves' interactive video 'Chameleon' (2008-2010) explores the scientific notion of 'emotional contagion', the dynamics of how emotions spread from one person to another in social contexts. An ambitious work at the interface of media art, neuroscience and advanced 'affective computing' being developed at the MIT Media Lab, 'Chameleon' interprets the notion of empathy as a kind of code that can be simulated in an installation context. The work continues and expands upon the artist's interest in the intimacies and vulnerabilities of human emotions. It is a genuinely interdisciplinary work that breaks new ground in terms of the dialogue between art, science and technology. This watercolor artist's paradise lies right at her back door - and at her front door as well. Gail Shaw's purpose-built studio is at the foot of wild mountain ranges, a long streak of waterfall dropping from great heights above giving emphasis to the untamed nature of this backdrop to her studies of rainforest plants, birds and animals. 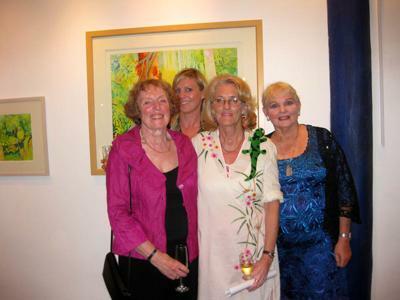 Having received a Regional Arts Development Grant in 2009, Gail has been working towards an exhibition of her beautiful watercolours for almost a year, resulting in a collection of works about the rainforest but also about the Great Barrier Reef, its fish and corals, which lie a short distance away. 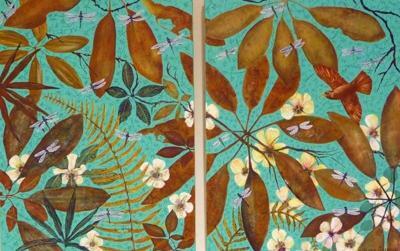 Using colour as tone, Gail has created vignettes of the rainforest and reef, telling a story about this magical part of the world - her Paradise. Her highly effective watercolor painting techniques include building up layers of paint to produce a strong and vibrant effect, rather unusual for this medium. On Friday last, a large group of art lovers from Port Douglas, Cairns and Sydney gathered together to enjoy Gail's exhibition, held in the appropriate setting of Karnak Rainforest Theatre. Owner, Diane Cilento, was on hand to welcome guests, who were entertained by Gail's interesting address. Councillor, Julia Leu, officially opened the exhibition, which will run until June 6. So why not enjoy a coffee and cake or lunch at Karnak's cafe, now open for the season, while you browse Gail's paintings. Who knows, you may find that perfect artwork that you have been searching for! 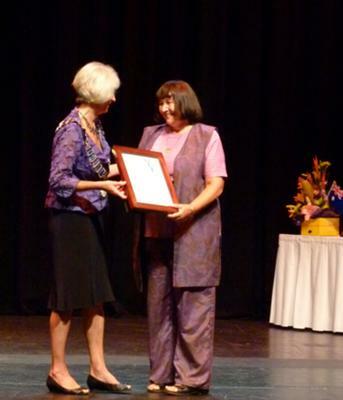 Association of Far North Queensland, was presented with Cairns Regional Council’s Australia day medal for Arts and Culture. The Cairns Regional Council Australia Day Awards are endorsed by the Federal and State Governments in line with the national Australia Day Awards, and recognise the unsung heroes in our community who enrich the lives of others, and do so with no fanfare and very little public recognition. As an accomplished Ceramicist and life member of both the Cairns Art Society and the Cairns Potters Club Lone has devoted enormous energy into the promotion, support and recognition of Visual Arts within the broader Cairns Region. Congratulations, Lone. 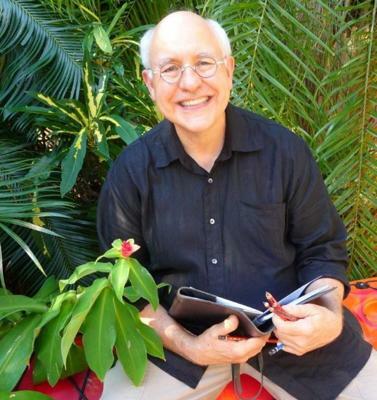 You have worked tirelessly over decades for the Arts of the Cairns region and your award is well deserved. 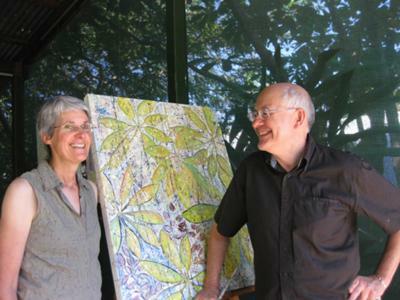 Terry Johnson, a Port Douglas artist, who also manages to spend much of the year in Robe, South Australia, where he and his wife, Nancy, have owned and managed an art gallery for many years, was the recipient this year of an Australia Day Award. The Citizen of the Year Awards are proudly presented by the Australia Day Council of South Australia, sponsored by San Remo, and administered by local Councils. The Awards reward and recognise individuals and organisations that have made a noteworthy contribution during the current year, and/or who give an outstanding service over a number of years, to a local community over and above normal employment duties. Outstanding contribution and community service includes areas such as; education, health, fund-raising, charitable and voluntary services, business, sport, arts, the environment, or any other area that contributes to the advancement and well-being of a community. Working with the community, extraordinary involvement in promoting and encouragement of the arts, working with youth, creative expertise given freely to the town for events such as annual Acquisitive art awards, Southern Ocean art prize, 150 Celebrations, artistic director of many town events, Member of Executive Committee of Limestone Coast Tourism Association, mentor of youth in educational ventures, designer of inaugural Village fair logos posters,Chinese re-enactment executive member, leader in tourism association work given to save Country Hospitals. "The cafe, retail and arts culture of Robe today is in no small part due to the influence Terry has had in inspiring artists, restaurateurs, retailers, photographers, and accommodation providers. Rather than seeing new businesses as competitors Terry would embrace them readily, sharing his and Nancy's collective wisdom to those who sought it. Congratulations to Terry for the Australia Day Award. It's always been a pleasure dealing with you and Nancy in Robe and to hear of your remarkable contribution in Port Douglas as well affirms the ethical and moral compass that you bring to the art world. From UK to France, cont.. The conference was part of a broader itinerary, which involved touring France for eight days, investigating pertinent sites associated with my artwork, especially pate de verre glass. Before we left for France there was an opportunity to do some limited touring in England where we visited Stonehenge, south Devon and did a big red bus tour of London. 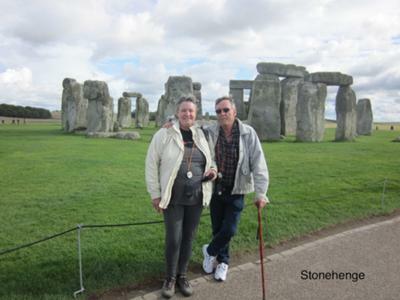 History and cultural stimulation at every turn in the road, and an inspiration to a visiting artist, especially Stonehenge, which has a presence that palpably reverberated down the centuries. We stayed right next to Waterloo Station in London at the Union Jack Club, reserved for serving and ex-military forces, very close to all the sights. After a short trip on Eurostar, we arrived at Gare du Nord in Paris, and made our way to the outer suburb of Ozoir la Ferriere, by train and bus and lots of walking to pick up the motorhome we had rented. It was only possible to include the north of France in our touring due to the short time available, so we made the most of it. 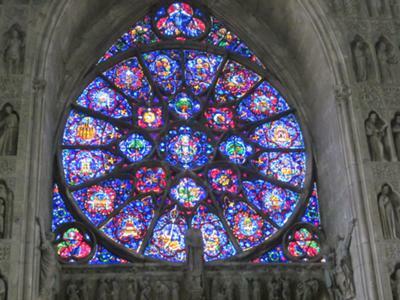 Our first destination was Reims, where I marvelled at the magnificent stained glass windows in the Notre-Dame de Reims cathedral. From there we travelled along very narrow roads, driving on the right hand side in a seven and a half meter long motorhome to Nancy, in Lorraine, to enjoy first hand, the beauty and excellence of Art Nouveau glass by Daum, Galle, and Decorchemont. Our route to Nancy took us through the magnificent area of Champagne, where we were distracted by all the chateaus selling boutique wines, necessitating an overnight stay. From here we returned west towards Versailles, then onto Giverny and Monet’s garden. As long as I live, I will never forget standing on the bridge in the water gardens, seeing all the aspects as Monet did for his paintings. 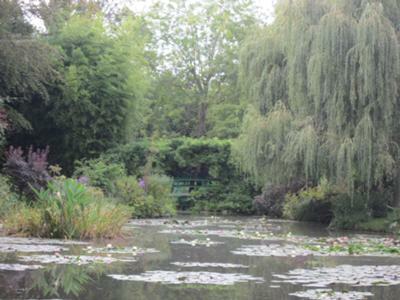 We spent three happy hours discovering the multitude of different aspects in the gardens and exploring Monet’s house and studio. That visit alone could easily inspire me for the rest of my life. Whilst travelling, we did not stay in caravan parks, but through the Passion France pass, were able to stay on farms, wineries and artisans’ homes for an inclusive fee of €29, valid at over 1600 destinations for 12 months. This was so much more enjoyable and allowed us to meet the people of France and sample farm produce, boutique wines and craftwork. From Giverny we travelled all the way through Normandy to Bayeux to see the famous tapestry depicting William the Conqueror’s invasion of England in 1066. A few miles further brought us to the D-Day landing site where we paused for contemplation on the events that occurred 70 years ago. 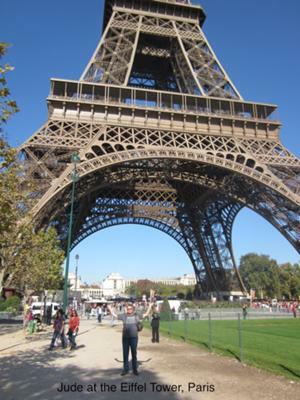 Paris beckoned, so we headed east again and decided to book at a caravan park in Bois de Boulogne, an inner suburb of Paris, so we would not have to drive the camper to see the sites, a scary proposition due to its size and the traffic in Paris. The metro is the way to get around Paris, so we took a train ending up at the base of the Arc de Triomphe in Place de l'Étoile at the top of the Champs-Élysées. Here we boarded another big red bus to do a hop on hop off tour of Paris, which was superb. Highlights included the Eiffel Tower, Cathedrale Notre Dame de Paris and of course the Louvre. Too soon we had to return the camper and catch our flight out of Charles de Gaulle airport. On our way back to the camper site, we inadvertently drove through a civil riot; rocks, fires, police with shields and machine guns, roadblocks; the real thing. A lesson learned here and everywhere we went in France - have some knowledge of the language, as young people tried to warn us before we got too far in, but because we couldn’t understand French, we thought they were trying to hitch a ride! Came out the other side shaken, but in one piece. Jetted off to Hong Kong where we had a twelve-hour stopover before our flight back to Cairns. By this stage we were a little weary, having not slept on the eleven-hour flight from Paris due to very uncomfortable seats. A note for the future- do not contemplate flights of more than four hours overseas unless you can afford business class! Whilst in Hong Kong, we did a short trip into Kowloon to see the sights then retired to the travellers lounge for a much needed massage, shower and food before our 11.30pm flight. Just to add spice to the equation we anxiously watched the approach of Typhoon Nesat heading directly for us. We were on one of the last flights to leave, before Hong Kong was closed down by the category eight storm. Finally arrived home to the lovely tropics on the morning of 29th September and slept for twelve hours. By the time we arrived in Cairns we had lost nine hours over the dateline as well as no sleep for thirty-six hours, just like being run over by a big red bus. Too much in too short a time - next time I have to plan less or arrange more time in the itinerary. So much we missed, but so much was absorbed. All up, a fantastic and rewarding experience. If the opportunity comes your way, don’t hesitate to tour overseas. Travel as the saying goes, broadens the mind and also provides a source of inspiration and memories that time will never take away. I’m already planning my next excursion. Think ancient rainforest, mangrove swamps, sun-basking crocs, screeching birds, sand flies and mozzies and you just might find me. Eons of years ago I graduated from The Ohio State University in Botany and the opportunity of combining my education and love of flora with my art is just too wonderful to resist. So again I have indulged myself in the splendour of a second season of personal study in the World Heritage Daintree Rainforest, investigating the natural patterns that exist in this pristine environment. Often I can be found wandering among towering fig trees, or sitting beside a jungle stream, looking, listening, drawing, but I leave without a trace, my only collection being ideas and inspiration. I began my interest in patterns at the Art Gallery of South Australia after discovering the outstanding collection of designs from the renowned British designer William Morris (1834 - 1896). This was an amazing discovery for me as the Art Gallery of South Australia has a unique association with the work of Morris through generous donations by the Barr Smith family once one of Morris and Co's biggest customers. If you are ever in Adelaide and love William Morris pay the gallery a visit or take a look at the collection on the gallery's web page. My new collection gleans inspiration from William Morris, drawing upon the look of his printed pattern and the control of colour, but unlike Morris' "True English Style" my patterns are drawn from looking deep into our Australian environment and bringing home what exists so freely and magically all about us. I see you research your subject matter before you begin a sketch. 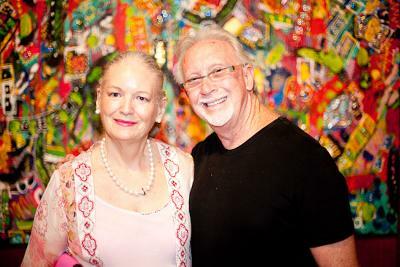 You are like a fellow artist, Ted E. Mueller, also seen on art-in-tropical-australia site. He also researches and sketches before he paints. And he does a beautiful job with his varied subject matter; going from lighthouses to covered bridges to beautiful water scenes and waterfalls, and even a depiction of "The Last Supper". 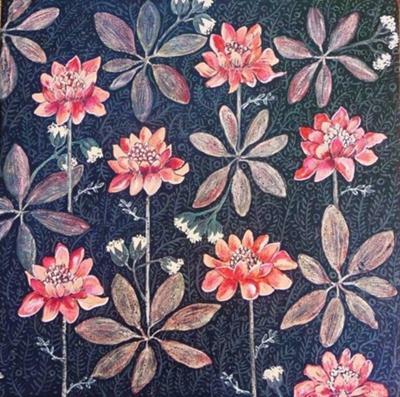 Apparently you are alike in that respect of research and sketches, and a very commendable way to create a painting. In September this year, I participated as a delegate at an international conference in the UK- “Making Futures”, The Crafts as Change Maker in Sustainably Aware Cultures. 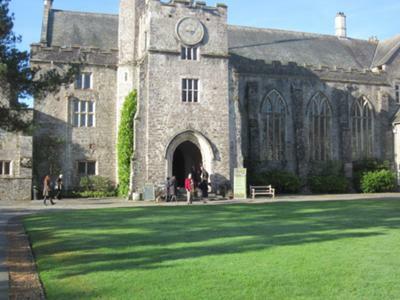 It was the 2nd edition of Making Futures and was held at Dartington Hall estate in the heart of Devon, a sprawling 200 acres surrounding the grand medieval residence and hall. (the fascinating history of Dartington can be read at http://www.dartington.org/about-the-trust/the-story-so-far . The conferences were conceived against a background of the global financial upheaval and a growing sense of desperation about the direction and sustainability of arts and crafts in the 21stC. The continued global situation of nationally fraught economies, urban unrest and rioting and imperatives of global climate change have obliged everyone to question the notion of sustainability. Against this backdrop, Making Futures engages in the debate of crafts’ position and relationship to society and the possibility of making significant contribution in the cultivation of resilient and sustainable communities. •	Regeneration in Glass- A Sustainable and Financially Viable Future. Anchoring the conference were six keynote speakers, Kate Soper (Emeritus Professor of Philosophy, London Metropolitan University), Trevor Marchard, (Professor, SOAS), Kevin Murray, (Adjunct Professor, RMIT, Melbourne), Chris Gibbon & Karen Yair (Crafts Council UK) and Catherine Hough (independent glass artist, UK), who opened the plenary sessions over the 2-day conference. Thirty-eight delegates also presented papers addressing the various strands, providing a wide scope of interpretation and suggested solutions to the questions of sustainability in the crafts. As it was physically impossible to participate in each strand and listen to all the papers due to the strands running concurrently, I will briefly summarise those that I attended personally. All abstracts are available on the Making Futures website- makingfutures.plymouthart.ac.uk, as will be the full papers in the near future. Obviously, as a glass artist, my main interest was in the Glass Research workshop conducted on Day one, although I found much food for thought in following other strands on Day two. Catherine Hough as keynote speaker, an independent glassmaker in the UK since the early 1970’s who stumbled into glassmaking quite by accident, opened the session. Her paper was underpinned with a history of the English studio glass movement as she discussed her own journey as an artist. The second paper, Technical & Reflective Rationality & the Implementation of a Sustainable Business was presented by the animated Ian Hankey, a lecturer at Plymouth College of Art, who has been researching 17th C furnace technology for the past six years. His paper investigated far more than the mere technology of furnace construction, but his research on the furnace held all enthralled. I would rate his paper as one of the most significant at the conference concerning ramifications of sustainability for the studio glass movement. The crux of his research is a low cost build and running furnace adapted from 17thC operations. The information on the furnace will be freely available to anyone willing to sign a “no-profit” clause as to resale. Xin Li, a Chinese student studying in the UK, presented the third paper, Researching the Sustainable Possibilities of Glass as a Creative Material. He discussed the benefit of developing sustainable glass product within the context of the studio glass movement. The fourth and final paper of the session, Studio Glass Sustainability: A Southern Perspective, by Judith Bohm-Parr was the paper I presented. This paper reported on research signposted by the continuing Art/Craft schism and the socio-economic challenges that bulwark the imperative of sustainability as an artist today. The afternoon session at the prototype furnace set up by Ian, was eagerly anticipated and well attended by the glass strand as well as many other delegates keen to see this innovative furnace. Ian had achieved the impossible - relatively inexpensive construction, combined with incredible efficiency on fuel consumption. He has also solved the problem of having to run a furnace 24/7. On day two I had to choose between the remaining four strands. It was explained we would have a better understanding and it would be more productive to remain with one strand rather than skip from one to the other. I chose Endangered subjects – Ethical Minds, where Dr Houghton instigated discussion with a paper entitled Craft Education: What is it. Where it Comes From and Where it is Going. The issue of education was a pivotal topic in the summary plenary discussions. The second speaker in this strand, Barber Swindells, put forward a case of care through craft in his paper More than Charity; Textiles in Daily Life. Dr Graham McLaren followed with a paper Ethics, Education and the ‘Kitchen Table’ Potter. He discussed the importance of manuals published between 1945-1970 as unsung but vital information concerning ethical approaches to making; usually written by the professional potter for amateurs. The afternoon session began with Keynote speakers, Chris Gibbon (Senior Consultant at BOP) & Dr Karen Yair (Crafts Council UK) who brought the delegates up-to-date on new research mapping the UK contemporary craft sector, the first study to be carried out simultaneously across England, Scotland, Wales & Northern Ireland. The research conducted as a phone survey considered all spectrum of the sector from makers, curators, and writers to retailers. Findings will be published in the next few weeks. The last strand I attended was Critical Perspectives on Post-Industrial Futures where two papers were presented. Mary Loveday-Edwards examined nostalgic responses to craft in her paper Craft as a Socially Aware Nostalgic Practice: Re-Envisioning a Positive Future. The final paper, entitled Take a Look at These Hands was presented by Malcolm Martin. This was a refreshing end to the session as he asked for the curtains to be opened and stepped away from the theoretical dialogue of the previous few hours to present an enthralling performance instead of the usual slide show. As with any conference, it was not all-hard work, in fact some of the livelier conversations took place at the Craft Council sponsored cocktail party on Thursday evening, many of which continued at the wonderful dinner. 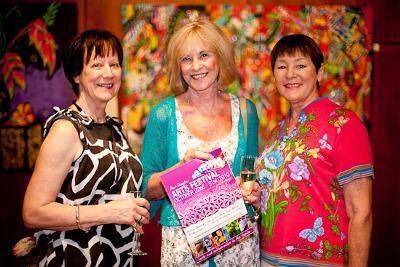 Delegates also had the opportunity of a private viewing in Plymouth of The British Art Show on Friday night. It was felt that there had been progress made since the first conference regarding issues of sustainability within practice, but a warning not to throw the baby out with the bath water by taking yourself out of the equation completely as craft will be needed in a post peak oil world. o	Craft still is referred to as the “C” word in parts of society. o	There is a still need for broader interaction with everyday life, an engagement with ‘real’ people instead of insular & sector based connection. o	Redefine the narrative of object/subject relationship, review ‘labelling, provide provenance. o	Consider a ‘fair trade brand’ in relation to the use of ethical materials; i.e. gold. o	Narrative needed on the value & connectedness of craft, too much theory, not enough practice. o	This would prompt craft ethos spreading into industry and so to society. o	Employ a positive vision towards sustainability rather than negative. o	A cohesive lobby group needed of not just craft people but all associated sectors (artist’s, designers, curators, makers, educators writers) to initiate change. I would like to acknowledge the support given by Arts Qld, who provided a career development grant to help cover costs, Plymouth College of Art for organisation and assistance during the conference and lastly the joint contribution of ALIAS and Plymouth College of Art for provision of a bursary covering registration at the conference. Jude, that sounds such a fantastic trip. Well done! If anyone would like to check Jude's work on this site please see https://www.art-in-tropical-australia.com/kiln-formed-glass-art.html . Follow the link at the bottom of that page if you would like to enroll for one of her fabulous glass workshops. Jude is now a master - it's official! 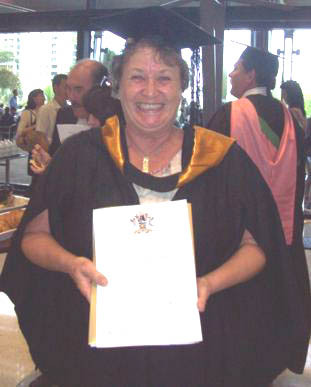 Established glass artist, Judith Bohm Parr, who lives and works in North Queensland, has recently graduated as a Master of Arts (Visual Arts) from James Cook University in Cairns. She tells me that her achievement took six long years of part-time study and practice. Well done, Jude!